Raising awareness and engaging the public is an important aspect of nature conservation.People protect what they care about, and to care, some knowledge is necessary. People power also drives action by governments and the private sector. It is the same for ASCOBANS. Institutions and people throughout the Agreement Area play an important role in spreading the word about threats and dangers to marine mammals, and ways in which each person can help. These actors are commonly found among environmental organizations, scientists and knowledgeable enthusiasts. In order to acknowledge extraordinary engagement in outreach and education activities, the ASCOBANS Parties launched a special award in 2005. The 25th Anniversary of ASCOBANS is an opportunity to look back and pay tribute to these five outstanding personalities and organizations for their support of the aim of ASCOBANS to protect small whales, dolphins and porpoises in Europe by means of their outreach and education activities. The first Outreach and Education Award in 2005 went to Hel Marine Stationin Poland for its efforts in this field. The biological field station situated in theGulf of Gdańsk is the only facility of its kind in Poland and represents therefore a valuable infrastructure for scientists in the Baltic Sea area. Besides conducting research in the Baltic Sea, Hel Marine Station engages in a wide ranging campaign for the conservation of the harbour porpoise in Poland.Educational activities such as workshops (Blue School), booklets, films, exhibitions and radio chats made Hel Marine Station a leader in Baltic Sea conservation efforts in Poland – more information here. 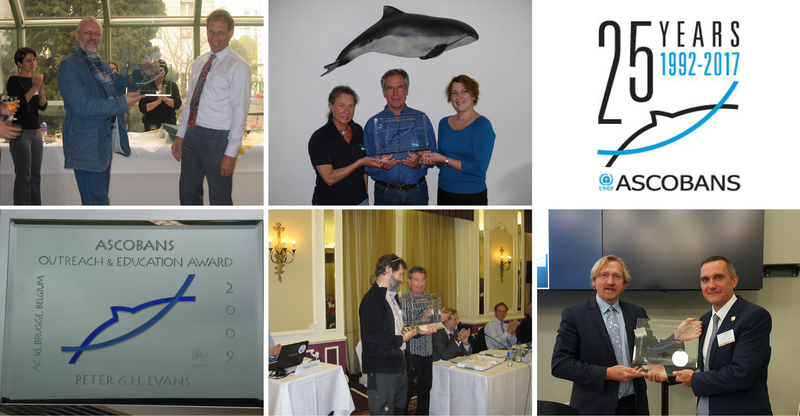 On the International Day of the Baltic Harbour Porpoise in 2007 ASCOBANS bestowed the second Award on Petra Deimer and Hans-Jürgen Schütte of the Society for the Protection of Marine Mammals (GSM, Gesellschaft zum Schutz der Meeressäugetiere). Petra Deimerran educational and public awareness raising initiatives, supported by her husband Hans-Jürgen Schüttefor more than 30 years. During the annual campaign “Sailors on the lookout for harbour porpoises” they approached sailing clubs, marinas and yachting magazines to report sightings of harbour porpoises – more information here. In 2009, the Sea Watch Foundation and its director Dr Peter Evans received the third Outreach and Education Award. The charity’s National Whale and Dolphin Watch is an annual opportunity for the public to participate in a survey of whales, dolphins and porpoises around the UK. Participants record sightings of animals along the coastline within a specific timeframe. This high-profile event draws utmost attention to the cause of conservation. Further, Sea Watch Foundation visits to schools, community groups and prepares educational resources that teachers can use to prepare their lessons. In addition, the Foundation supports several MSc or BSc projects every year – more information here. The Swedish dolphin expert Mats Amundin received recognition in 2012 from the juryfor his contribution to raising the awareness of small cetaceans. He conducts research and teaches at university level. Mats also coordinated the SAMBAH Project (more information here). This project was key in gathering data on the abundance and distribution of porpoises in the Baltic Sea, achieved through acoustic monitoring (see also our article in this series: Saving the Harbour Porpoise in the Baltic Sea). Mats also addresses the general public on the International Day of the Baltic Harbour Porpoise and similar events or during special guided tours at the Kolmården Wildlife Park in order to illustrate the threats to small cetaceans. The most recent Award winner is Whale and Dolphin Conservation (WDC). The organization provides a variety of activities on a global scale, comprising social media platforms and sponsoring of projects and outreach campaigns. Their Wildlife Centres and their citizen science project (Shorewatch) reach out to a wide audience. In Germany, WDC supports campaigns such as “Walheimat” (homes for whales), focusing on effective marine protected areas for cetaceans, or “Die letzten 300” (The last 300), a creativity competition and resulting exhibition about the endangered harbour porpoises in the Baltic Sea run in collaboration with ASCOBANS and two other partners – more information here. The next ASCOBANS Outreach and Education Award will be conferred in 2020. Until then, the previous winners, the Secretariat, and all the many people throughout the Agreement Area who are passionate about cetacean conservation will continue to do their best to gain widespread support for effective conservation of small cetaceans. This year marks the 25th anniversary of the opening for signature of the Agreement on the Conservation of Small Cetaceans of the Baltic and North Seas (ASCOBANS) in New York on 17 March 1992. Over the past 25 years, ASCOBANS has provided the framework for international cooperation for the protection of small cetaceans – whales, dolphins and porpoises – in northern and western European waters. This is the fourth of 25 stories emphasizing milestones and special achievements of ASCOBANS throughout the year of its silver anniversary.